Imagine that Ford was held responsible every time one of its Mustangs broke the speed limit. Imagine that the company responded by limiting the speed of its vehicles to 65 MPH, or that the company was required by the government to report every speeding car to highway patrol. It sounds far-fetched, but is actually a good metaphor for the way that many want technology companies to respond to infractions. 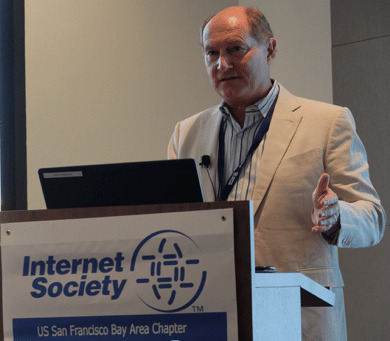 During a recent event called “Blaming Technology”, organized by the San Francisco-Bay Area Internet Society Chapter and hosted by Fenwick & West LLC, acclaimed IP attorney Andrew Bridges explained that there is “really a war on where we apply the rule of law” with new technologies. Normally, in the United States, we expect that the rule of law will be enforced by monitoring public behavior: in the speeding car example, the car manufacturer isn’t responsible for speeding, the driver is. But as the public has seen the power of tech platforms to limit behavior and content, they are asking these private companies to take on a responsibility usually handled by public entities: enforcing laws. Where these companies fail to deliver, they are asking for them to be held liable. Bridges knows a thing or two about this: he successfully defended payment processors when they were sued for processing payments for merchants accused of copyright and trademark infringement (Perfect 10 v. Visa and MasterCard) and he defended Google when the company was sued for linking to potentially illegal material in its searches, wherein he established that such searches are fair use (Perfect 10 v. Google, Perfect 10 v. Amazon.com). But the debate continues on how much we want private companies to act as deputies of government or private interests. Of course, it is within the legal right of any individual technology company to limit the users and uses of its platform; they are allowed to choose which values to associate with their brand. But once an entire industry or government requires that these platforms remove objectionable content, the situation easily becomes untenable with the first amendment freedoms that are at the heart of the Internet, the freedom of speech and freedom to assemble. To allow private companies to become moderators of the law, Bridges argues, is dangerous ground when you don’t know the competence of the moderators. For any of the issues people complain about on the Internet, whether they’re privacy concerns, terrorism, fake news, hate speech, or copyright infringement, the moderator needs a lot of context to decode the legitimate from the infraction. Even the case of copyright infringements, which may seem pretty cut-and-dry, can be complicated. Say someone from outside of your household was using your wireless network to download music illegally? Or say it wasn’t actually illegal, because it was an album they already bought? Is it appropriate to ask technological providers to take on the responsibility of finding out the context in every situation? As Bridges said, “Tech and online platforms are controversial because they are important tools for the public and what the public does, in many cases, is controversial.” Keeping the Internet open to all and ensuring that people are able to communicate with others is essential to our global freedoms, and not something we should ever give away lightly. Companies are not always going to speak adequately for the public, and so it is essential that Internet citizens step forward to make sure their voices are heard on this issue. One avenue available to you is to become a member of the San Francisco Bay Internet Society Chapter to join with others engaged on these topics. You can also participate in person or remotely at the upcoming Internet Governance Forum USA (IGF-USA) taking place on July 24 in Washington D.C.. Chapter board members will participate and the SF-Bay ISOC Working Group on Internet Governance Chair, Dr. Brandie Nonnecke, will be moderating a panel session on Promoting a More Inclusive Internet. Stay engaged so that the policy makers in D.C have to listen to the many voices from all parts of the US and beyond that have strong opinions on how the rule of law should be applied to existing and emerging technologies. This article was written by Jenna Spagnolo on behalf of the SF Bay Area Internet Society Chapter.